If you follow me on social media, then you may have saw the announcement... 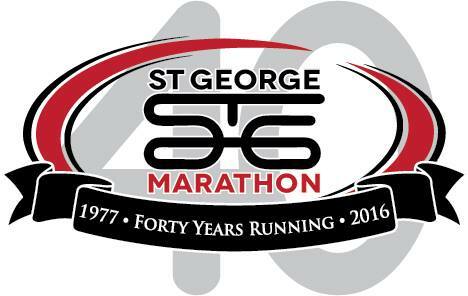 I will be running the St. George Marathon on October 1st! Not only that, I am going to attempt to BQ (Boston Qualify) on the course! After the Phoenix Marathon in February, I didn't have any full marathons on my calendar (well, I guess that isn't technically true... I had the 2017 Phoenix Marathon and 2017 Los Angeles Marathon on the calendar, but those were over a year away at that point). I decided I should start looking for a fast fall full to train for (because why not?!). I have found that the best way to find great races is to ask the running community. So, off to social media to find some suggestions. 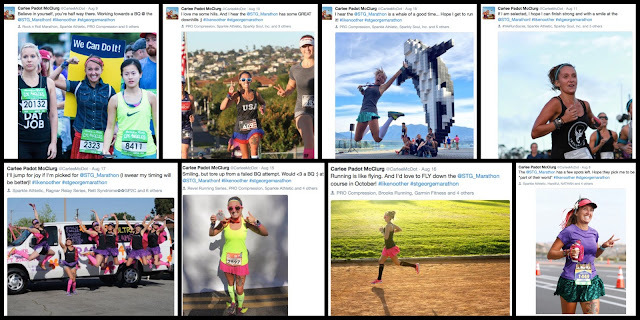 I heard amazing things about the St. George Marathon, Twin Cities Marathon, Erie Marathon, Wineglass Marathon, Steamboat Marathon and an assortment of others. Then it was time to narrow the field. 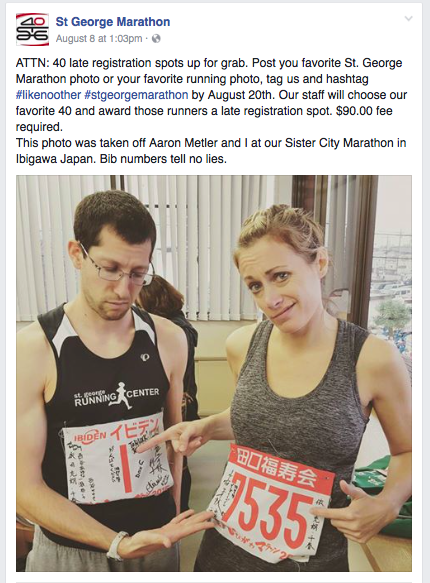 A friend of mine actually told me that he had won a guaranteed entry into the St. George Marathon (the race is now on a lottery entry system) and if he wouldn't be able to use it he said he would be willing to transfer it to me. Okay, so I decided that I wouldn't enter the lottery and if it was meant to be then it would be. The friend is a high school band director and his fall schedule is pretty crazy (actually his schedule is always crazy with all the running, traveling, music playing, etc he is doing). I didn't want to pressure him by constantly hounding him about the entry so I decided I would train as if I would run the race, but not necessarily put in all of the speed work. You see, I didn't want to put in 100% effort to find out that the race wasn't a possibility. I put in the miles, but the track and tempo workouts weren't there as regularly as they should have been (because, let's be real, speed work is HARD!). Well, about a month ago my friend let me know he was told that he was not able to transfer the entry to me. I was bummed, but decided that maybe it was God's way of closing the door. But being the stubborn one that I am, I thought I'd try one last time. I shot an email to the race director to see if there was any possibility of an entry floating around the office. I prayed and told God if there was a possibility of me BQ'ing at the race (not that getting in would be an automatic BQ, but that my fitness level and ability had the chance to BQ on the perfect day) then He would make it happen. 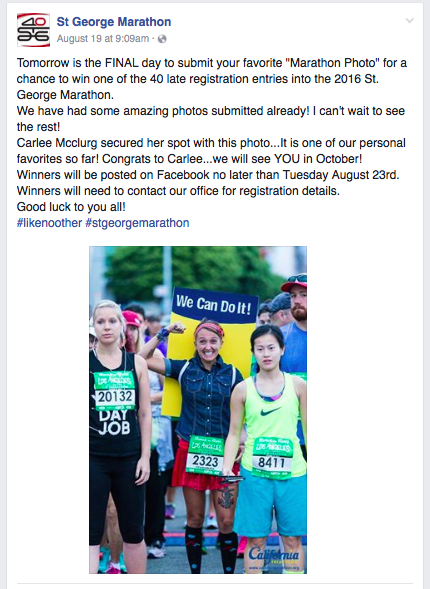 Yup, they had 40 late entries and were going to award them to their 40 favorite running photos (in all fairness, they weren't "giving them away", you would still have to pay the $90 registration fee, but hey, I'd take any opportunity I could get at this point). And if you know me, you know I love entering contests! So, you know what I did? I submitted a different photo every day. I went for the funny (costume races - showing that I could have a good time), I shared strong photos (showing that not only do I love to run and smile while I do it, I put in the effort to better myself and my paces) and I even pulled at the heart strings (mentioning how much of a heart break my last failed BQ attempt was). WHOOOOOOO HOOOOOO! I was so excited! And then the panic set in... Sure I had been training for the distance, but is the speed there? I honestly was worried it wasn't. But then again, when I was chatting with God a few weeks prior I told Him that I would only want to get in if there was a possibility to snag my BQ, so I figured that the feasibility has to be there (although I am going to have to work my booty off to make it happen!). 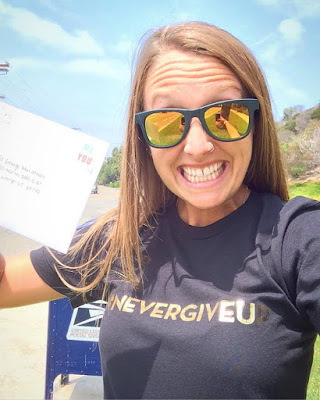 So at the end of last week I mailed in my registration (yup, although this race is celebrating its 40th year, the registration process is done via the US Postal Service and mailing in a check... can you say #OldSchool?). I haven't received my email confirmation yet (I would assume that is probably due to the speed of the Pony Express), but as of right now, all signs point to the fact that I will be toeing the starting line of the St. George Marathon on October 1st. And if you haven't looked at a calendar lately, I'll let you know... that means I have FIVE WEEKS to make this BQ a reality! Is it possible? Yes. Will it take everything I've got? I know it will. Am I going to give it my all? You better believe it! Do I believe in myself? Not totally, but I have some amazing friends who believe I can do hard things so I'm gonna start listening to them a little more (or at least trying to). Is it going to hurt? I would imagine so, but anything worth doing/ having takes effort. The hard is what makes it good, right?! So, these next few weeks will be intense (although I probably only have two to three weeks before I have to start my taper), but when I arrive in St. George I want to be able to leave it all out on the course and see what my body is able to accomplish. As the race gets closer I will share my specific goals, but for now - send all the speedy and calming thoughts and prayers my way! I can use them ALL! Ideally, how long are your training cycles? I'm so excited for you! You're strong and totally capable of BQing! Go rock that race. Like I said before, YOU GOT THIS girl!! I'm so proud of you for putting yourself out there and believing that anything is possible. I'll be cheering for you so loud that day!!! Carlee you can do anything! You have more grit and determination than anyone I know. BELIEVE!!!! Lots of love and speedy wishes coming your way! I couldn't love this more! And I 1000000% believe with my whole heart you got this babe! You're the cutest! All your hard work paid off! Congrats! I can't wait to see how it goes! This is amazing girl and so cool that you blog about your fitness journey! All the faith! All the speedy vibes! YGT! YCDHT! so fun! way to go!! Woo - that's awesome! Rooting for you! Congrats! That's amazing that it all happened this way. I went to St. George last year when I ran the Zion Half Marathon and it's such a gorgeous place. Try to check out Zion and Bryce while you're in the area if you have any ability to walk after the race! Such an inspiration! Good luck in the race! Go Carlee! I have faith in you! Hopefully they will have some pace groups. You can glue yourself to the 3:30 people and go get it! Congrats - you really worked for that entry posting all your photos! And STG, really, is a bargain at $90. Most half marathons cost more than that now. And it's really organized with the usual big race features. I would do it again in a heart beat (then again, there are so many stinkin' options in October, might be a while before I go back). Hope you were able to get a decent hotel - those seem to book pretty fast too. I stayed at something with Crystal Inn in the name. Can't remember exactly. Really nice though.